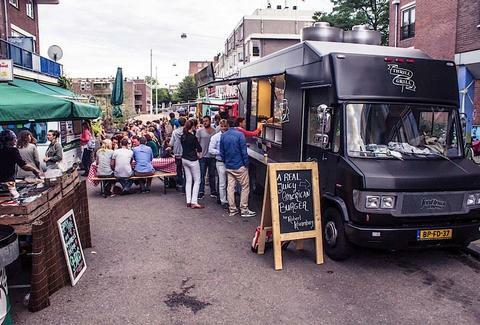 Food trucks are finally becoming a thing in Amsterdam (which is just one thing to explain to visitors) though the cramped city doesn’t know what to do with them outside festivals and markets. The solution? Create more festivals and markets. Here are six rolling vendors you should track down around town, and three awesome events where you can find them. What They’ve Got: Amsterdam’s got a burger obsession, and this mobile meat machine is ready to feed it with classic charcoal burgers plus a salmon-patty twist concocted by double-Michelin-starred Chef Robert Kranenborg. Festival Alert!... 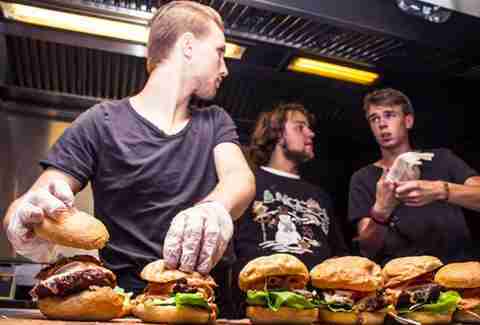 like Het Weekend van de Rollende Keukens (“Weekend of the Rolling Kitchens”), Amsterdam’s biggest and best, five-day food truck festival with music and more. Westerpark, May 28th-June 1st, free entrance. What They’ve Got: Amsterdam’s practically overrun with herring carts, where the raw fish are held by the tail and gobbled whole, often coated in onions. (After the fresh “Hollandse Nieuwe” is released June 12th, though, you won’t need the onions.) 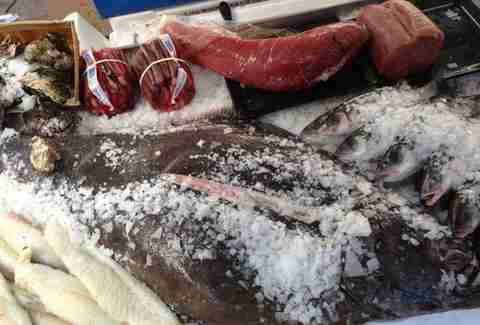 But this mobile fish fest is so, so much more, with seafare from halibut to take home to oysters to gobble on the spot. They even deliver (for free in the Oud-Zuid area)! Where & When to Find Them: They’ve got a full-time shop, now, in the Spaarndammerbuurt. But you’ll still see their cart or stand at markets and festivals around town (check their website and Facebook page). Festival Alert! 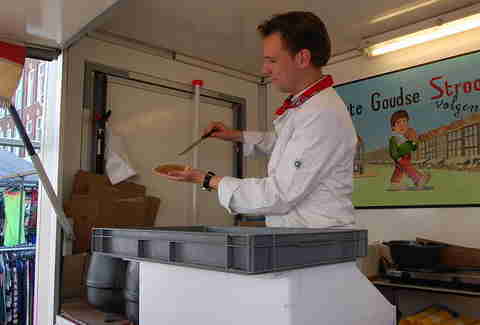 Vis van Henry will be one of nine trucks popping up at the second edition of Het Hoofdgerecht (“The Main Course”) food truck and arts festival, put on by The Food Line-Up. Het Stenen Hoofd, Westerdoksdijk, June 12th-15th, tickets €10-15. 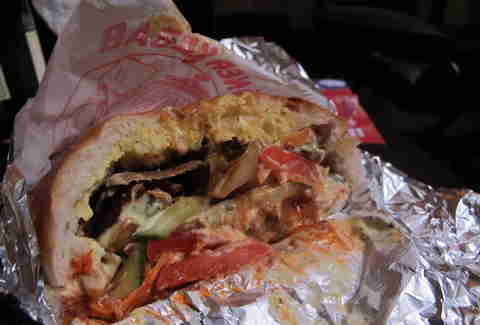 What They’ve Got: The most legendary kebab shack in the city is apparently also the only honest one -- when TV food inspectors the KvW tested 10 sandwiches, theirs was the only one that was actually 100% lamb, as advertised. Equally tasty is the Turkish pizza. Where & When to Find Them: Every day except Sunday at the top of the Dappermarkt flea market. 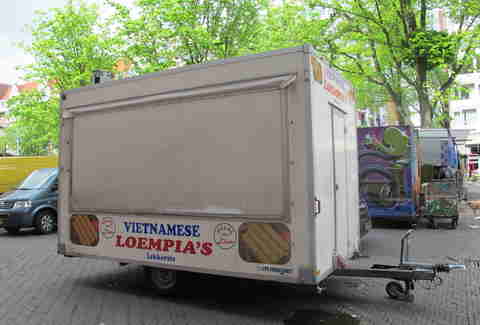 What They’ve Got: €1 buys you the best giant loempia (Spring roll) you have ever tasted, guaranteed. All the snacks are prepared by hand by Mevrouw Minh, who is known for her bubbly personality and for singing (presumably nice things) in Vietnamese while she works. Where & When to Find Them: Every day except Sunday at the Waterlooplein flea market, next to the entrance to city hall. What They’ve Got: Like a deluxe deli on wheels, Eatery will supply you with all the wholesome ingredients to make a supercharged salad or they'll dish out ravioli, soups, empanadas, and more. Where & When to Find Them: Eatery usually pops up in regular locations up to 3x per week. Follow their Facebook and website to find them. Event Alert! 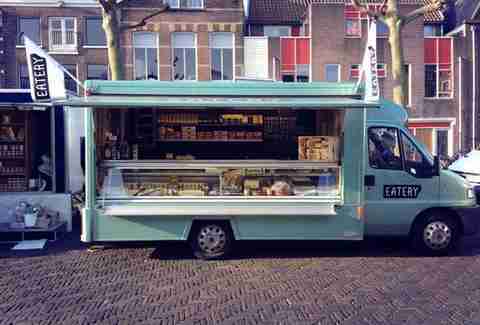 Eatery is the mastermind behind last year’s weekly Kanen bij Ten Kate food truck fair every Thursday 4-9pm on the Ten Katemarkt. Plans are to start up again in June. What They’ve Got: If you taste these flat caramel-waffle cookies from a cold stack in the grocery store, you will think they are the best thing the Dutch have ever made. If you taste the oversized, ooey-gooey, fresh-off-the-griddle version sold here (for a mere €1.50), you'll probably burn your passport in the hopes you never have to leave. Where & When to Find Them: Every day except Sunday at the Albert Cuyp flea market, in the middle near Bazar restaurant.